SHARE What better time to give guests cocktail favors than at a festive holiday party? 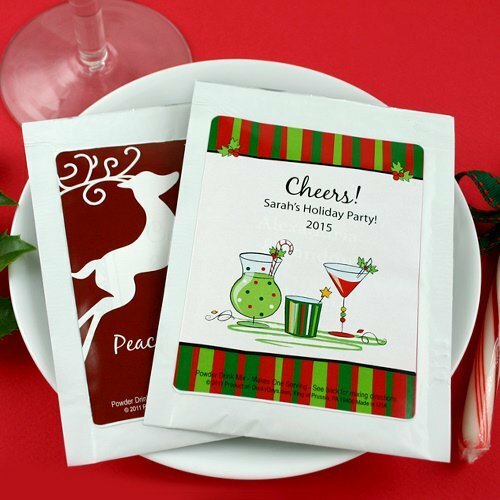 These single serve Margarita drink mixes come in 24 fun and festive holiday designs such as trees, ornaments, snowflakes, penguins and more. Just choose something to match the theme of your party then add 3 lines of your own text for a memorable favor. Cocktail Drink Mix Info: Each one ounce drink mix packet makes a single serving of a non-alcoholic beverage. Package directions are included for adding alcohol to the mix. White glossy packets measure approximately 4" wide x 5.5" tall. They have a shelf life of 1 year and are not kosher.